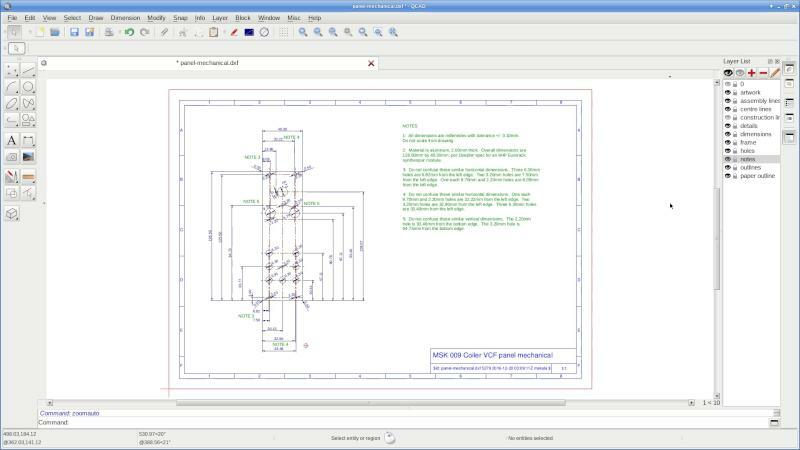 Here I'm doing a mechanical drawing of the 8HP Eurorack panel for the Coiler VCF, using QCad. The entire process is over 80 minutes long, with a lot of repetitive work, so I've trimmed it a little to make an easier video to watch, although all the major steps are still included. This is my first high-resolution video posted here - it's 1920x1080, capturing one side of my two-monitor desktop at full resolution - and I'm not yet sure how well it will work on the Web; I'll be interested to hear any reports on how it compares to my other, lower-resolution videos. My screen wallpaper seen near the start of this video is by Shapoco.